I know that it has been a while since the last chapter, but life has been crazy busy. Anyway, thanks for hanging in there. 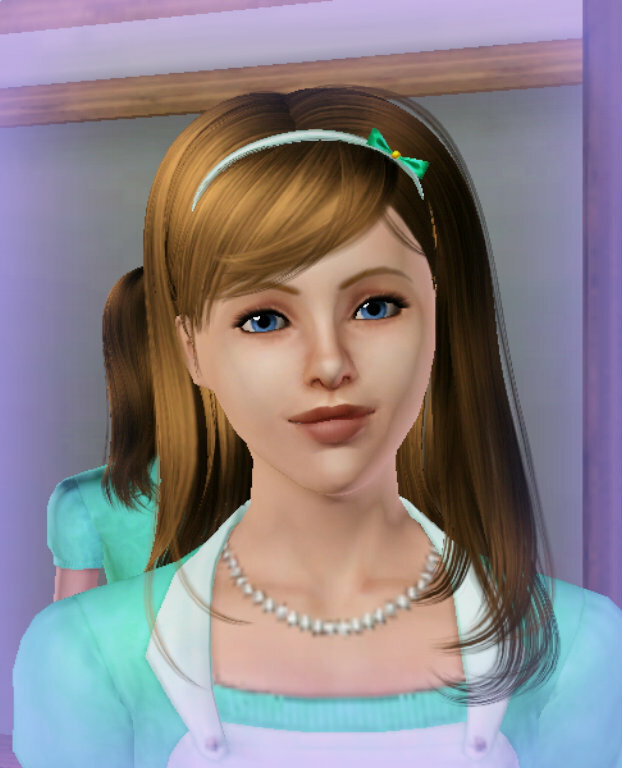 And, without further ado, here is Cindy as a teen. Unfortunately, Cindy’s fist day as a teen didn’t start out so well. She had used her sink about 100 times as a child. But the first time she uses it as a teen, it breaks. “No big deal.” Cindy tried to stay positive. “It’s just a simple repair.” That simple repair put Cindy behind on her chores for the day. And now that Cindy can cook, Missy is expecting her to cook every meal. If breakfast isn’t ready by the time Missy wakes up there will be hell to pay. Drusella is starting her first morning as a teen the same way she always has. With her morning ice cream (is it weird that the ice cream truck is always parked outside of the house?) I’m sure with all of the money that Drusella has spent on the ice cream the truck driver has to be close to retirement by now. The other Evils were given Cindy’s blueberry waffles. It was Cindy’s first attempt at cooking so I’m just happy that she didn’t start a fire. Too bad Anastasis doesn’t share my joy. “I will not tolerate such disrespect as to serve me burnt food!” Anastasis yelled at her stepsister. The food was no where near burnt, but that didn’t stop Anastasis from throwing the plate on the ground. “This is not how I wanted to start out my teenage years! These are suppose to be the best years of my life!” “Mother,” Anastasis turned her attention away from Cindy and began whining to her mother. With a high pitched tone she demanded, “why is my life so hard? !” “My poor baby.” Missy responded with genuine sympathy. “Mommy will try and make it all better”. Missy pondered on what she could buy her children that would make them happy. What do teenagers want? Anastasis wants to be popular, but Drusella just wants more food. Missy wanted to buy them something fun yet practical (or at least practical by her standards) In the end she bought them both musical instruments. I decided to name their band Hear No Evil. Get it?! Since their last name is Evil?! I know I’m a dork, just humor me here. Now they are just like the VonTrapp Family. Only more evil. After a few hours of playing together, Hear No Evil decided that they were ready to take their act on the road. So, they went to the park to put on a show for all of Riverview. Meanwhile Cindy was down in her basement. 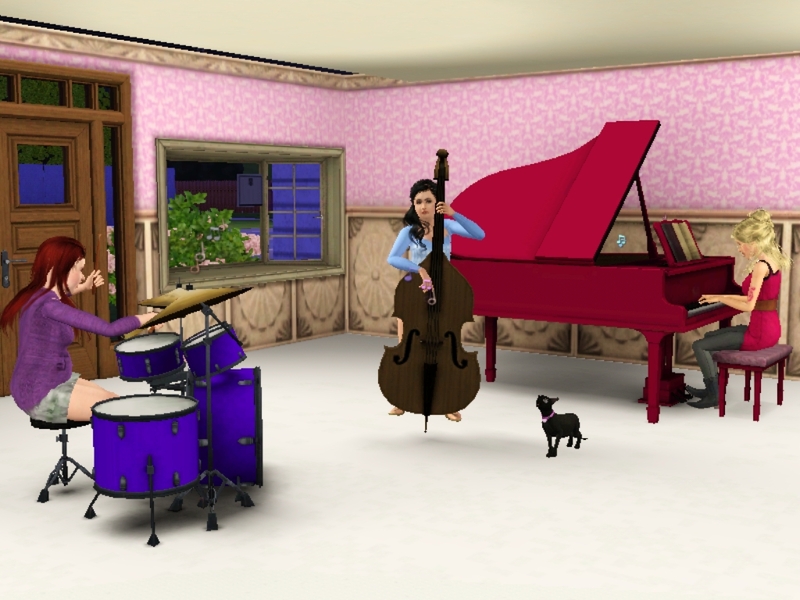 She had suffered through that horrible noise that her stepfamily calls music and was ready for some R&R. She found an old cookbook upstairs and began searching for new recipes. But soon her mind began to wander. She dreamed about one day leaving the dark moldy confines of her basement and moving into a huge mansion. Cindy thought about what she wanted to be when she grew up. Thanks to her hard work in elementary school, Cindy is enrolled in all honors classes in high school. But she didn’t have much of a plan after high school. Missy took joy in constantly reminding Cindy that there was no future for her outside of her dirty basement. But still Cindy wanted, more than anything, to have a huge family. She promised that she would be the most loving mother she could, and that she would never make any of her family feel unwanted. But a knock on her door brought her back to reality and back down to her cold, empty living space. “Who would be knocking on my door?” Cindy thought as she made her way up the stairs. No one ever knocks on Cindy’s door. If Missy or the girls wanted anything they opened the door then yelled at Cindy to get it for them. “who’s there?” Cindy asked as she cracked open the door. When she found that there was no one there she opened the door a bit further. Cindy was so distracted in her search for the mystery visitor that she almost missed the envelope that had fallen at her feet. “Who would be sending me a letter?” Cindy thought out loud. The curiosity was getting to Cindy, so she didn’t even wait to get back into her basement before she tore open the envelope. She unfolded the letter, written on the most beautiful stationary Cindy had ever seen, and began to read out loud. Cindy is a smart girl. And most smart girls wouldn’t go dashing off into a taxi to meet some stranger. 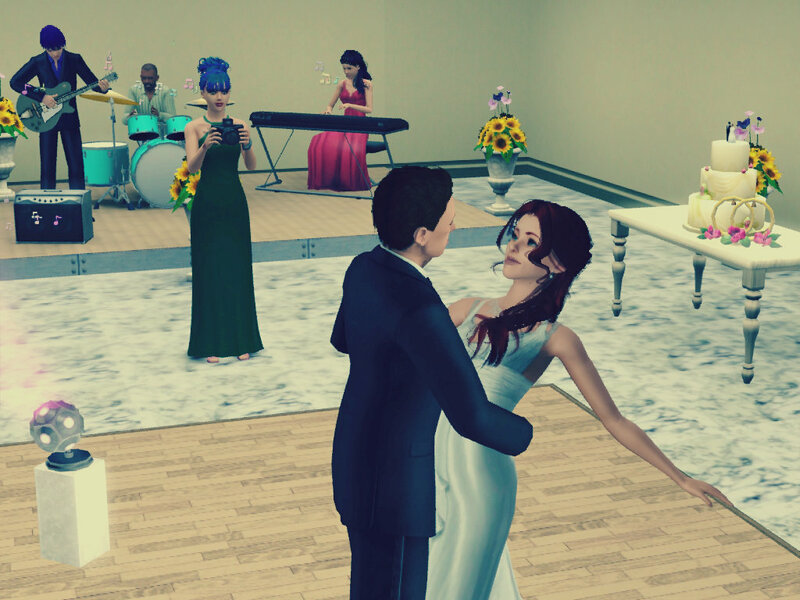 But this sim said that they knew Cindy’s parents. That is Cindy’s weakness, her Achilles’ heal. She would risk anything and everything to find out more about her parents. “Where to?” the taxi driver asked. The driver was an older man. He was tall and heavy set with balding yellow, blonde hair. The taxi smelled of cheap cologne and new car smell. She gave the taxi driver the address, and she was on her way. They drove up a winding dirt road that seemed to reach far beyond the boundaries of the small town. The taxi was taking Cindy to a far off corner of Riverview that she had never been to before. (Not that she got out that much). Then he pulled off to the side of the road and announced, “We’re here.” Cindy took a moment to gather her thoughts and find her bearings. At first glance Cindy didn’t see anything besides a bunch of pine trees. Not one was distinguishable from the other. But upon further inspection she noticed a wooden gate partly hidden in between a tree and a large rock. “Who could live all the way out here?” Cindy thought to herself. The taxi driver, noticing the confused look on his passenger’s face, explained, “Just go up past the gate, follow the path, then you’ll see the cottage.” “How much do I owe you?” Cindy asked as she reached into her apron pocket. “Forget about it.” the taxi driver reassured her, “Any friend of Fay is a friend of mine.” Cindy thanked the driver with a shy smile, and followed his instructions to find the cottage. Once Cindy made it past the wall of trees the cottage was easy to find. It was small and very colorful. The cottage had a blue tiled roof and a path of purple flowers leading to a bright green door. On each side of the door stood two large marble columns. Cindy made her way to the door and pressed the doorbell which chimed Bibbidi-Bobbidi-Boo. Fay led Cindy into the dinning room table to talk. On the table there was an old, worn out shoebox and two mugs. “Your mother and I were friends in high school.” Fay began her story by pouring each of them a cup of hot cocoa. “I was brand new to Riverview and some of the kids made fun of me for being different. But not your mother. She was kind to everyone and everything. She sat with me during lunch when no one else would. 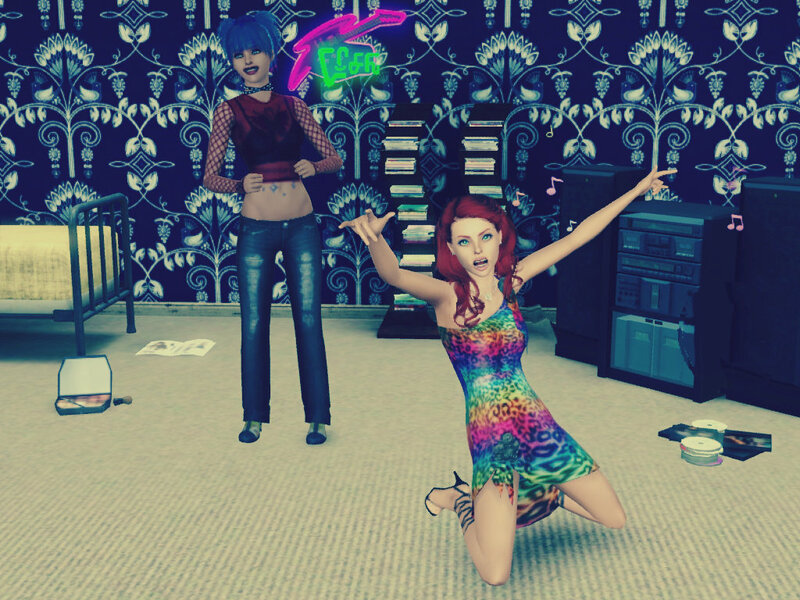 We were best friends from that moment on.” Fay was the prettiest sim Cindy had ever seen. 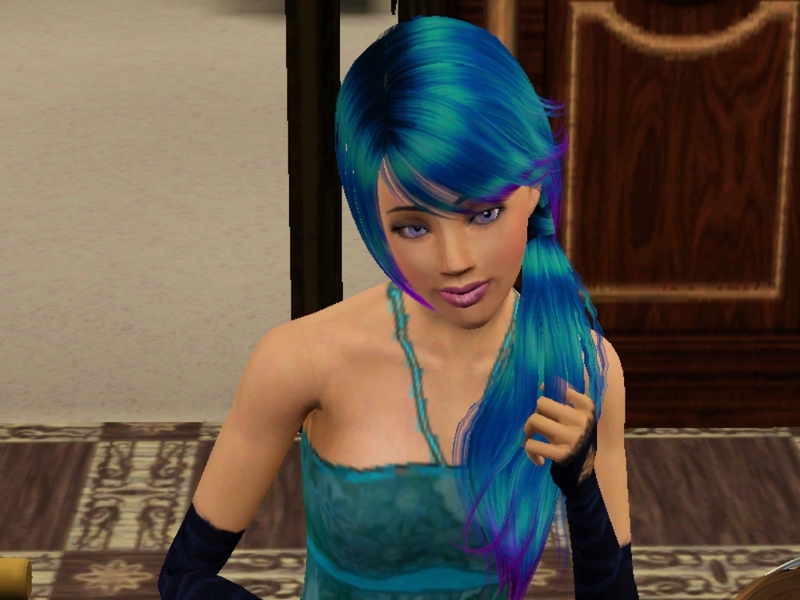 Her hair was varying shades of blue, teal, and purple which blended flawlessly together. Fay’s eyes were naturally purple and her makeup looked like it had been applied by a professional. No wonder the other kids made fun of Fay. They were jealous of her. Cindy hung on every word. She had a million questions, but wanted to let Fay finish her story. “Then after high school we both enrolled at the University.” Fay continued her story. “And that is where she met your father. It was love at first sight.” Fay paused and took a sip of her cocoa. “They were married right after graduation.” Fay reached for the shoebox at the other end of the table. “I have a picture of them here somewhere.” Fay dug around the box and handed a picture to Cindy. “But if my dad loved my mom so much, why did he marry Missy?” Cindy couldn’t hold her questions in any longer. “They met at a widow support group. I never knew what he saw in her.” Fay explained. “I understand that he didn’t want you to grow up without a mother. And at first I was supportive of your father wanting to remarry. But I don’t know what he saw in her.” Cindy could hear the distain in Fay’s voice as she talked about Missy. “After they married she tried keeping me away from the both of you. And I didn’t hear about your father’s passing until almost a month later.” “Missy threw everything of his away.” Cindy said. “She didn’t want anything to remind her of my father, and that includes me too.” “I know,” Fay put her arm on Cindy’s shoulder. “But now that you are a teenager, I thought that this would be the prefect time to try and contact you.” Cindy’s eyes light up as a thought entered her mind. It was a crazy idea but, “you could adopt me! And I could stay here with you.” “I wish I could.” Fay explained. “I even talked with a lawyer friend of mine. But he said that Missy is your legal guardian and that the only I could gain custody of you is if she were to give you up.” “And she is never going to do that.” Cindy said defeated. The time passed too quickly. Before they knew it Cindy had to return home. 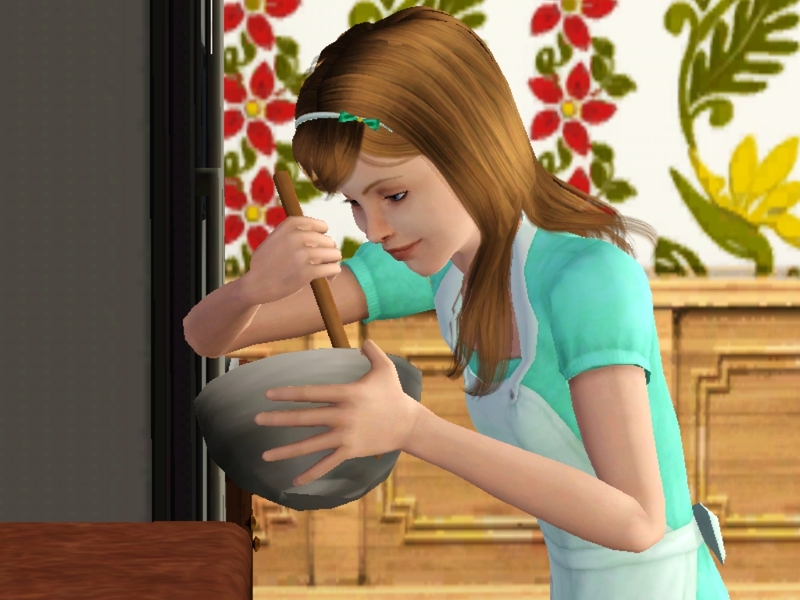 She still has to prepare dinner for her evil stepfamily. “Don’t forget to call me.” Fay said at the door. “Don’t worry, I won’t” Cindy reassured her godmother with a warm hug goodbye. As Cindy walked down the path to meet the taxi she noticed that her surrounding were looking different. The sun was brighter. The birds sang sweeter. The clouds were fluffier. The world was not so dark and scary. The future didn’t seem so hopeless. Cindy Rella knew she had a friend. Awww, so now, there’s light at the end of the tunnel for Cindy. It’s nice that She found Fay and now has a friend. She won’t be so lonely anymore in a world that seems to hate her. Let’s hope Fay has more up her sleeve to help Cindy. Thank you again for the comment. Fay is just what Cindy needs to help her deal with the Evils. Cindy is gorgeous as a teen! I wish we all had a fairy godmother…sigh! Cindy definitely needs someone in her corner. Cindy is one step closer to finding her Happy Ever After. And now it isn’t so bad now that she finally has someone on her side. It is so cute. I loved reading about Fay, it must be a huge relief to Cindy to know that there is someone taking care of her. Cindy’s world just got a little brighter knowing that she has someone in her corner (which will come in handy later on). Once again, thank you for leaving such nice comments. It must be so emotional for her to see her mother in the pictures! It is emotional, but Cindy finally has a connection to her parents that she thought was lost forever. Cindy is so very pretty as a teen! And Fay is also gorgeous! I really love the modern spin on this story, and Fay being her actual godmother (and I even like the play on her name being Fay, cuz fairy, ha! okay I’ll excuse myself now…). The pictures of Cindy’s mom really got me lol, funny and cute! Fay has to be one of my favorite sims that I ever created. Beautiful inside and out.